Stone grinding is one of the most ancient ways that food has been processed. If you think about it, grains are inherently hard to eat and grinding them into a coarse meal made grains more accessible to our ancestors. When it comes to stone milling, we’re talking about our ancestors’ ancestors’ ancestors. Stone milling was not reserved for grains, either. Stone mills were used to grind almost everything – nuts, seeds, spices, roots, etc. With all of the modern advancement, why would anyone choose to stone grind? First off, there is something romantic about the old-world technology of stone mills. That is how Bob first became interested in stone grinding. The idea of putting one pound of flour into a mill and getting one pound of flour out is almost magical—such a simple idea that reminds you of all that is right in the world. Stone milling also allows the grains to be ground more slowly to produce flour at a cool temperature that may help preserve its inherent enzymes. 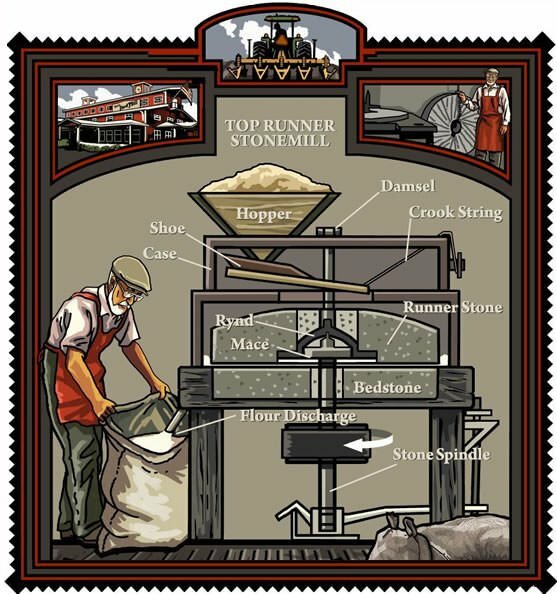 This illustration gives you an idea about what goes into stone milling. Briefly, clean grain begins its journey to freshly milled flour in the hopper. 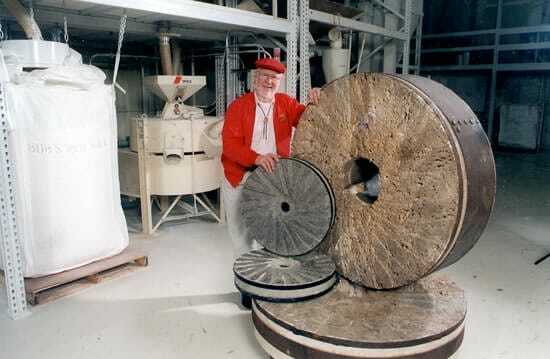 From the hopper, grain is ground by slow-moving quartz millstones to produce flour. The upper stone moves grain against the lower stone, or bed stone, to produce the flour. Adjusting the lower stone controls the granulation of the flour. The drive pulley kindles the milling magic. The drive pulley is motor-driven, but throughout history it has been propelled by man, animal, water and wind. Flour milled at Bob’s Red Mill is made with 100% whole grains. What is placed in the hopper comes out of the flour spout as smooth, wholesome whole grain flour perfect for baking. 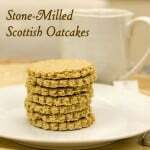 Speaking of baking, we hope you will enjoy this recipe for Scottish Oatcakes. 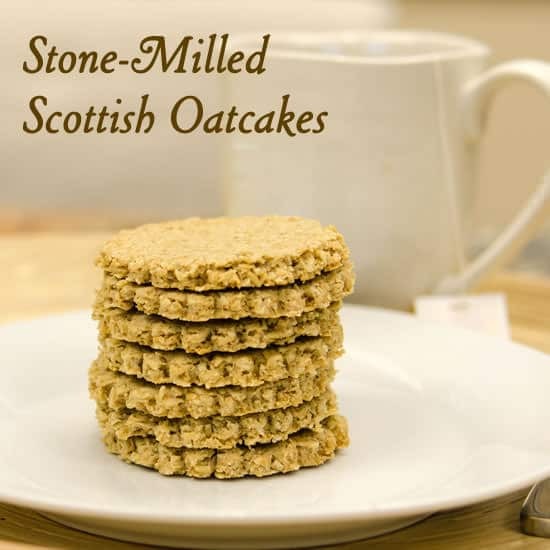 Oatmeal has its origins in Scottish stone milling. Our Scottish oatmeal is the real deal—coarsely stone ground oats. These little crackers are wonderful on their own and excellent served with jam. They also make a perfect, whole grain base for hors d’oeuvres. Preheat oven to 325°F. Place 1-1/3 cups of the Scottish oatmeal in a bowl with flour, sugar, salt and baking powder; stir until combined. Add butter and stir until evenly distributed. Mixing with a fork, drizzle in water until a soft dough just comes together. Pat dough into a ball, then flatten slightly. Sprinkle remaining 2 tablespoons oats on a cutting board. Roll dough out ¼ inch thick. With a 2 to 3 inch round cutter, cut dough into rounds. Re-roll and cut scraps. 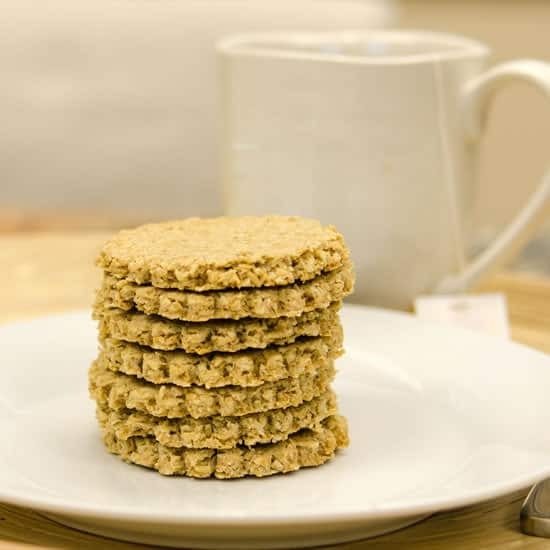 Place oatcakes about ¼ inch apart on a greased baking sheet. Bake at 325°F until Scottish Oatcakes are golden, approximately 25 minutes. Let cool on a rack. Makes 12 - 15 oatcakes. These sound delicious. I’m curious if you have any suggestions for making them without wheat? Can you use Oat flour instead of wheat? Where would I find unprocessed sugar?